George Washington was the 1st President of the United States of America, the symbolic leader of the country. His presidency began in 1789 and ended in 1797. He was 57 years old when he first began his term of office on April 30, 1789. His surname derives from the place name of Washington in Tyne and Wear, England where his family originated. He had a variety of nicknames including the Father of His Country, The American Cincinnatus, The American Fabius and the Town Destroyer. The 'American Cincinnatus' was a reference to the famous Roman who won a war but choose to become a citizen rather than seeking power. Fabius was a nickname in reference to another Roman General who was famous for his war strategies. The picture of George Washington portrays an interesting image of what this famous man looked like. The picture shows the clothing and the hairstyle that was fashionable during his presidency. He is described as being an imposing figure standing at 6 feet 1.5 inches and he weighed 175lbs. He has a long thin face with a prominent nose. He had blue-gray eyes, a fair complexion and dark brown hair. The fashion was to wear a wig on formal occasions and this is how George Washington is normally pictured, with his wig tied at the back of his head. George Washington was a rich man a wore expensive, fashionable clothes. He lost his teeth and wore ill-fitting dentures that made speech difficult as he grew old. Character and Personality Traits: What he like? The personality of George Washington is described as being ambitious, reserved, moral, brave, serious and although usually easy to get along with his temper could erupt for short periods of time. George Washington was well known for being careful with his money. The important role and duties of the President of the United States of America include those of Chief of State, Chief Diplomat, Chief Executive, Commander in Chief, Legislative Leader and Leader of his own political party. What was George Washington famous for? Why was George Washington important? The history and life of President George Washington during his presidency is conveyed in the following fact file in an easy question and answer format. What President was George Washington? What other political offices did George Washington hold before his presidency? Who was his Vice President and Secretary of State? Who was George Washington' s first lady? George Washington was famous for the events and accomplishments of his presidency, but what are the facts about the man and his private life. 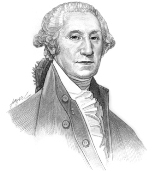 Facts and information about the private life of George Washington can be found in the following fact file in an easy question and answer format. When and where was George Washington born? Where was George Washington educated and what was his religion? What did George Washington do before he became President of the United States? Who was George Washington' wife and when did they marry? Did they have kids? George Washington died on December 14, 1799 in Mount Vernon, Virginia. We hope that the picture, facts and information on President George Washington will prove helpful to kids, school children and schools learning about the presidency of this famous American leader. The facts about George Washington provides an overview of the President's character and personality traits. Watch the video and learn more about the major events of his life and his accomplishments. The following George Washington video is a useful educational resource for kids, children and schools learning about the life of the US President George Washington.